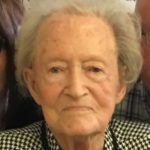 Geneva M. Gilliland, 88, passed away January 19, 2019 at Golden Living Center in Tell City, Indiana. Born July 21, 1930 in Lewisport, KY, she was the daughter of John W. and Helen (Bryant) Dixon. Geneva was a 1948 graduate of Tell City High School and retired as mailroom supervisor of the Perry County News. She married George Gilliland on April 6, 1951 who preceded her in death. She was a lifelong member of First Baptist Church in Tell City and was active in the WMU. Geneva enjoyed cooking and canning, yard sales, gardening, reading and most of all, her family. Survivors include her children; George R. Gilliland (Glenda) of Hawesville, KY, Cathy Gilliland of Evansville, IN, Donnie Gilliland (Paula) of Clarksville, TN, Mike Gilliland (Jenny) of Shelbyville, KY, Tim Gilliland (Carolyn) of Haubstadt, IN, Tom Gilliland (MarYsol) of Owensboro, KY; 14 grandchildren; 34 great-grandchildren; and 1 great, great-grandchild. In addition to her husband George, preceding her in death are her parents, a sister Ruby Kessner and a brother William Earl Dixon. Funeral services will be at 11:00 am Tuesday January 22, 2019 at First Baptist Church in Tell City with Pastor Dan Hopkins officiating. Burial will be in Greenwood Cemetery. Visitation will be from 3 pm to 8 pm Monday at Zoercher- Gillick Funeral Home and from 9 am to service time at First Baptist Church. Memorial contributions may be given to the First Baptist Church.